Set on the edge of the championship south golf course this stunning villa 524 is within easy reach of a fantastic range of other sporting and leisure facilities, yet far enough away from everything to offer relaxed seclusion. La Manga 524 has been recently refurbished to the highest standard, and while the exterior of the single storey villa is designed in the traditional Mediterranean Spanish style, the modern interior is beautifully furnished and fitted out with all the must have conveniences, including free Wi-Fi, flat screen satellite television, iPod dock, and DVD player. La Manga 524 has four bedrooms, two of them en-suite, as well as a light and spacious lounge, dining area, fully equipped kitchen with breakfast bar, and utility room. The villa is air conditioned throughout, so you can be comfortable whatever time of year you holiday in this beautiful part of Spain. 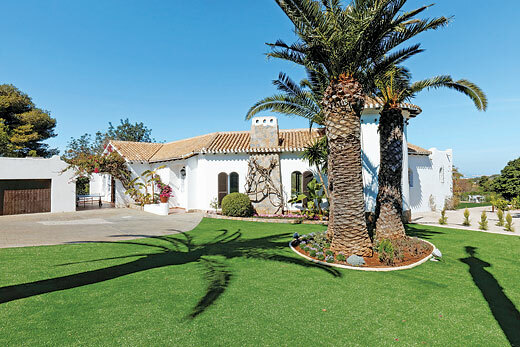 If you want to soak up the abundant Murcian sunshine, you can relax on a sun lounger by your own private swimming pool, bordered by a well kept and spacious lawn, and you can also enjoy al fresco dining with family and friends on the generous sized terrace, which has a built-in barbecue. Perfect for large families or a group of friends, La Manga 524 is only minutes away from some of the resort’s world class facilities, as well as a choice of great clubs, bars, and restaurants. The nearest supermarket is within easy reach, and the beach is just 2km. La Manga Club is 35 minutes from Murcia airport, and 90 minutes form Alicante airport..